Halloween On The Farm [D8804] - $10.00 : Yarn Tree, Your wholesale source for cross stitch supplies. Cross stitch pattern by Kathy Barrick. 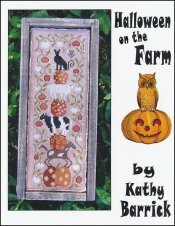 A stack of farm animals and pumpkins is bordered by vines. Stitch count 58 wide x 173 high.